Green Organic Villas will suit those who want to getaway from the usual hustle and bustle of Vietnam. Ad Book now! Rates from US$112++. Average rating 8.1 from 152 reviews. Ignore the fluffy buzzwords jammed packed into the name, the simplicity of the experience should be the appeal. 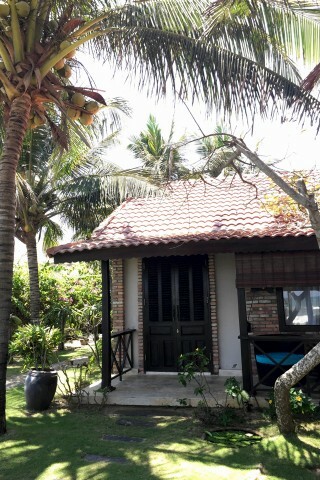 Set 19 kilometres south of Phan Thiet City on a stretch of wild beach, this property of just seven bungalows provides enough comfort for a restful stay: there’s a swimming pool, the beach and comfortable accommodation. Behind the plain brick exterior are unapologetically opulent, feminine, frilly and over the top interiors. We appreciate that it has character and comforts, though the dollhouse fantasty may be to costumey for some. Each room has a different decor. We saw one of powder blue linens, dove grey walls, dreamy white bed canopy, soaring tongue and groove plank ceiling with chandelier. And the lilac bathroom – imagine a place where well-heeled ladies go to powder their noses and adjust their pearls. Design frills aside, you do get a flatscreen TV, minibar, WiFi and air-con. Some are beachfront. Guests are limited to eating at their restaurant, which has an upstairs bird’s nest lounge/lookout. We’ll have to dock a few points for the homage to Novak Djokovic (sorry, we’re on Team Roger Federer). Otherwise, if you have your own transport, there are some large Russian tour series resorts in this area along the coast. The rate includes breakfast. The beach is fairly wild and that means rubbish does get washed ashore. Overall, it’s a quiet spot – it’ll never be busy or crowded. That may be just what you are looking for. Check rates at Green Organic Villas on Booking.com.